The snake is the sixth symbol in the Japanese Zodiac. It’s said that snakes do not forget any good and bad deed done to them. Legend has it that when a fisherman saved a white snake, it repaid him with treasure. This symbol represents “inquisitiveness” and “passion”. Snakes are deep thinkers, great observers, and possess tremendous wisdom. They do not like conflicts, and get along with anyone. However, their tendency to avoid conflicts can put them under considerable stress. They are also the jealous type, and can do something mean behind people’s backs. Are always fortunate in money matters. Have introverted nature and are not good at expressing themselves. Snakes are most compatible with oxen and roosters. If these three come together, it generates a great positive power. Snakes also have a mutually beneficial relationship with monkeys. Boars are the least compatible with snakes. 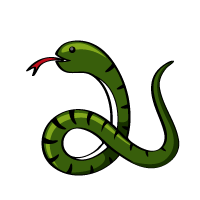 In Japanese, a snake is “hebi” in romaji, and is written as “蛇” in kanji. In the Japanese Zodiac, however, it is often called “mi” and is written as “巳”.